Is buying a cheap alternative brand hot-shoe flash a great way to save hundreds of dollars or are you just wasting your money? Let’s start with the key difference. So what are the similarities? Manual Control: All four flashes allow you to manually control both the level of power and the zoom on the flash. Slave Modes: All four flashes allow you to slave the flash so it fires when it detects the light from another flash. PC Sockets: Three flashes (not the Pentax) have a PC socket – particularly useful when using Pocket Wizards for manual off-camera flash. TTL Flash Metering (Auto Power Control): The cheap Yongnuo is all manual. You need to adjust the power rather than the camera sending out a pre-flash, measuring the amount of light that has returned and giving out a main flash that will give you what it assumes to be the correct amount of light. Auto Zoom Control: The camera can tell the flash the focal length of the lens being used and therefore the angle of view. The flash automatically adjusts its zoom so that the spread of the light matches the angle of view. High Speed Sync: High speed sync allows you to use flash at shutter speeds greater than the flash sync speed of the camera, useful when you want to shoot outdoors with a wide aperture. Infrared Wireless Communication: The ability to communicate with off camera flashes using an on camera (or pop-up) flash. This allows you to use TTL flash metering when using off camera flash. LED Display: A clear display on the back of the flash that shows mode, power settings, zoom settings.The Yongnuo displays all the information through a series of LED lights on the back of the camera. The row of orange lights is used to indicate both zoom and power which can lead to confusion. Build Quality and Reliability: The first time I used one of the YN560s it gave off a strange burning smell. I thought I’d fried it, but it has continued to work without any strange smells or problems since then. I doubt it has the same degree of weather sealing or ruggedness as the other flash units, but I’m not planning on a series of drop tests. In summary, the more expensive flashes can do everything the cheap flashes can do plus various bells and whistles. The ability to use TTL metering is useful in some circumstances, but once you are using multiple flashes and radio triggers it is less useful or not even usable. The advanced infrared communication systems also have their place, but are less effective than radio triggers when using manual mode. 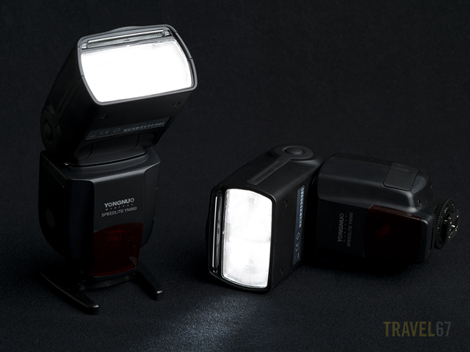 If you’re buying a single flash, have the money, and want the flexibility to shoot with TTL then get the matching flash from your camera’s manufacturer. If, however, you’re experimenting with off-camera flash and looking at getting a second or third flash then you could happily save yourself several hundred dollars by getting a couple of Yongnuo YN560s. Right. I have two YN-460II (one for my wife), and I’m very happy with those. Should I buy again, I’d get this one instead. Recommended. Extensive an concise review, many thanks. I own canon60D and a speedlite 430EX II. But for my off camera flash i a going with Yongnuo YN560 and Yongnuo RF-603 C3 2.4GHz Wireless Flash that I alredy own (doing the job for me). Just got my 560 in with an external SF-18 battery pack and a Lambency Flash diffuser and I’m already in love. I can’t believe how much power this thing has compared to my Canon 420 and 430 EXII, I wanted a second flash to go on my T1i as a bounce flash for shooting with as my 430 usually stays with my Rebel XT. I didn’t wanna spend a fortune trying to get another 430, and as much as I love my Canon gear I’m just as tickled with what I’ve just received. Yes it’s a good, simple little flash. I have the YN-560 , I mainly used it off the camera , I find it awesome, but since it is my first flash ever I dont how true is this feeling 😀 . Today I ordered another one to use them both off camera . 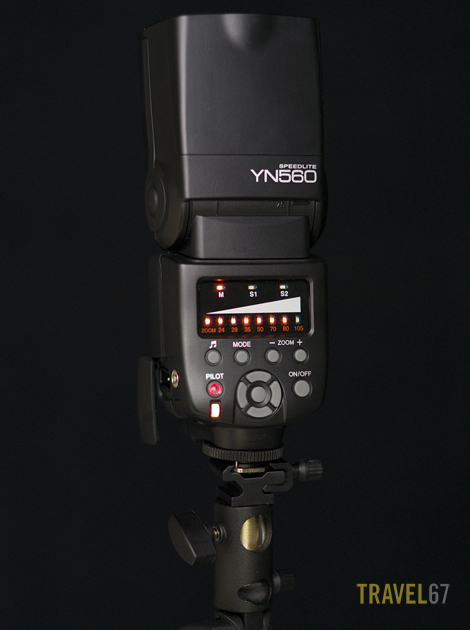 but then I got really disappointed when I found another YN TTL flash fro nearly the same price which is the YN-465 ….. So my question here , I switch between off and on the camera all over the time . So will be the YN-465 better for me or I can continue with the 560 .
and since I will have 2* YN-560 off camera . I dont know how am going to operate them . I have the YN- RF-603 trigger, What I am going to need !? I feel you have everything under control. With the type of work you are doing, you will eventually need the second YN560. I have found it to be ideal for fill in to eliminate background or side shadows when mounted on an umbrella. As far as what to do; All I can say is to do what I did. And that is, trial and error. I also make a concerted effort to document everything I do, distance to subject, fstop, shutter speed, ambient light, etc., etc. You made a very wise decision to purchase this flash unit. I also use mine as a main flash at times, mounted on the camera. So far, I have experienced wonderful results. It really just takes time and patience whenever buying new equipment. I hope this helps and keep the good work.